The pair will meet for the first time. Thanasi Kokkinakis knocked out No. 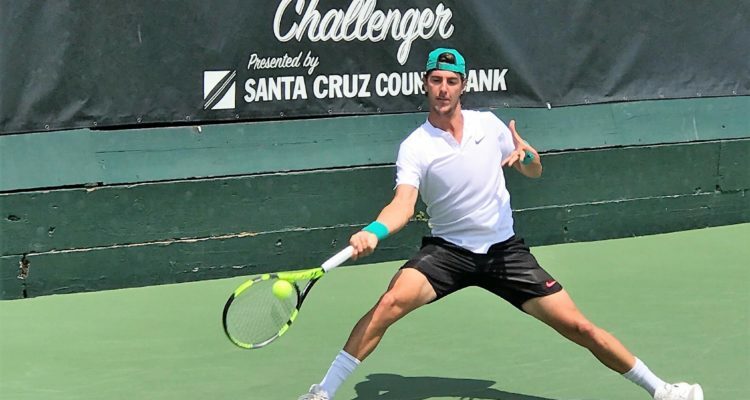 1 seed Thomas Fabbiano of Italy 7-5, 6-1 at the $100,000 Nordic Naturals Challenger presented by Santa Cruz County Bank to reach his first ATP Challenger final since Bordeaux 2015. The 22-year-old Australian fired 11 aces, winning 77 per cent of his first service points to prevail in one hour and 20 minutes. “It was a very tough game from the start. After the break in the first set, I really had to raise my level of play,” Kokkinakis said. Kokkinakis will face in-form South African Lloyd Harris in Sunday’s title match at the Seascape Sports Club. The #NextGenATP player, who clinched his maiden Challenger trophy in Binghamton last week, cruised past US-American youngster Christopher Eubanks 6-2, 6-2 in only 46 minutes. “I made him play every point and really found my range to get the ball deep into the court, making it difficult for him to return,” Harris described the key to success. This entry was posted in ATP Challenger Aptos, ATP Challenger Tour and tagged Aptos, ATP Challenger Tour, Thanasi Kokkinakis.